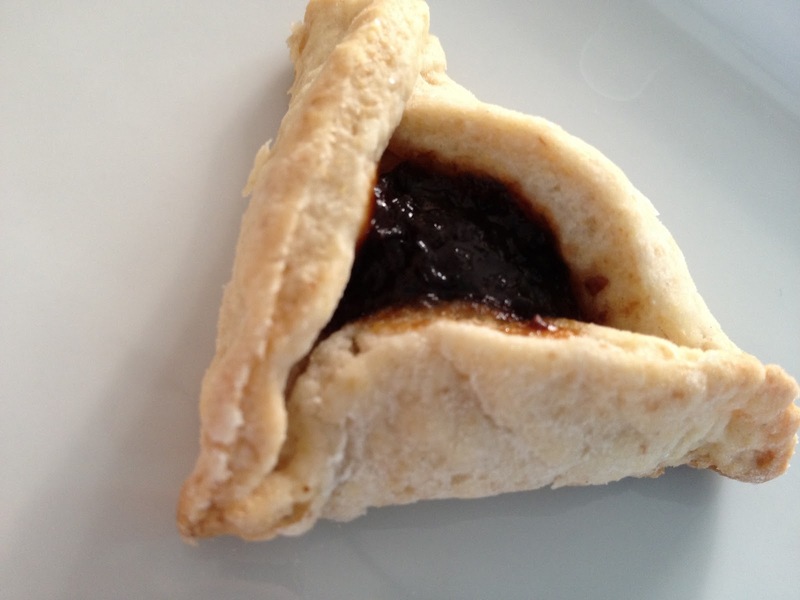 Hamantaschen are traditional Purim cookies that represent Haman’s hats. If we eat them, the evil will go away! Growing up, we made these exactly once at our big kitchen table. It takes some practice to get the ends to stay together. I found that pinching is not good enough; the edges have to fold over slightly. The cookies are slightly cake-y and the sweet/tart flavor of the prune filling makes these irresistible. I used my homemade prune puree for the filling which I started making for Luke when he was 6 months old. Preheat oven to 375. Line baking sheets with parchment paper. Make the flax eggs. Flour a clean surface and a rolling pin. Roll out the dough and use a 3″ cookie cutter to cut out circles. Place them on the baking sheet, gather up the scraps and continue until done. Using a 1/2 teaspoon measure, drop the prune puree in the middle of each cookie. Pull the edges together and fold them into a triangle. Don’t pinch…fold.